Some of the ingredients in those pricey little jars can be a little “iffy” too. Since it’s commonly made from sweetened condensed milk (admittedly not the healthiest thing, either) it’s pretty simple to make it at home. I’ve made it completely from scratch (use a double boiler and be prepared to stir and stir and stir) which is a pain in the you know what. I’ve made it by simmering a can of sweetened condensed milk stove-top, which is NOT recommended. I’ve made it in the crockpot with canning jars – you’ll want to leave a little headspace and very, very carefully tighten the rings only until you feel resistance. This is considered to be the safest way because as the heat the contents, the air can be forced out. I usually just set cans of sweetened condensed milk (no need to remove the labels, they’ll just fall off) in the crockpot and let them caramelize away to caramelly goodness overnight, 10 hours on low. I’ve heard there is a possibility that the cans could explode, but never had a problem. So I’m taking a few chances, I know. What you’re left with is a somewhat grody can (remove them carefully and set them to dry on something you don’t care about until cool) and the most caramelly goodness inside. Buy your sweetened condensed milk during the holiday sales (when so many baking goods are at their lowest and coupons are available) and you’ll have bargain priced Dulce de Leche all year long. 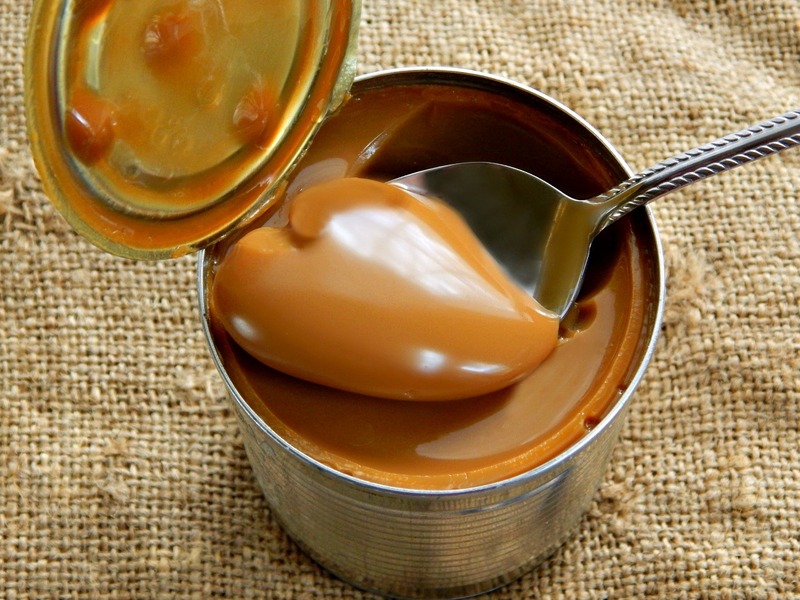 Dulce de Leche from Sweetened Condensed Milk – yes, the cans do NOT look attractive but wait till you see what’s inside! Place a can of sweetened condensed milk in the slow cooker. Add water to a level two inches above the cans. Add lid and cook for 10 hours on low. Open a can of sweetened condensed milk, stir to distribute contents evenly. Put in canning jar, leaving about 1/2 inch of headspace, clean off the lip, add the lid, then rings. Tighten only until resistance is felt. Place in crockpot. Add water to cover by two inches. Add lid and cook for 10 hours on low. With either recipe, cool to room temperature before opening. This entry was posted in Click here for Fabulous Food Posts and tagged condensed milk, Dessert Sauces, Desserts, Dulce de Leche, Easy Recipe, Frugal Hausfrau, Slow Cooker. Bookmark the permalink. You mention that dulce de leche can be pricey, but here I have a problem finding kosher condensed milk, so I always(!) have to make my own. As for dulce the leche – I should try your version once ans see, as I always use the oven, and not the stove. I think the key to whichever method you use, if it’s in the can, is to cover with at least two inches of water. That helps to stabilize the temperature. I feel for you because I’ve made my own condensed milk and what a pain that was!! Lots and lots of attention and stirring! I’ve always wanted to do this. Some recipes put the the can in the oven too I think??? A little scary, though. Yup, I’m chicken alright 😄 but I think I should just go ahead and try. What’s the worst that could happen, right?! I think the key is to have it covered with water so it stays at a really gentle heat. Gosh, I’d hate to clean out an oven. Worst chore in the world!! I keep saying that I’m going to try this method- it seemed scary to me. :/ Looks AMAZING! I’ve done it a few times with no problem but then I just figured what was the worst that could happen? Even if the can did have too much pressure it would have to go through the heavy crockpot lid. I don’t think those cans would propel out with too much force – but now that I’ve said that just watch, I’ll probably be cleaning dulce de leche off my kitchen ceiling, lol!! Yum!! It looks so good and so easy. I really do need to give this a try one of these days. You are smart to stock up on sweetened condensed milk during the holidays. I need to start doing that! It’s kind of funny coz my folks have never shopped well – they were a little stunned when I came home with a dozen cans of condensed milk and about 8 pounds of butter, lol! And let’s not mention the tuna fish I bought during Lent!! These really look delicious! And good to have an alternative for the store bought dulce de leche which is hard to find in germany. I used a pressure cooker to make it. Gets done in an hour or so….. 🙂 Your DDL looks awesome. Good to see alternative methods for making dulce de leche, Which is something I’ve never tried. Thanks for the inclusion on the Fiesta! Sorry to reply so late! Thank you for hosting! PS: No crockpot but I’ve done them in a simmering pot of water on the stove. And in the microwave. But I overcooked them there so the condensed milk turned into hard caramel. That’s right, there is a microwave method! wow what a great tip.. and the pics make it look so tempting! Thanks for sharing.